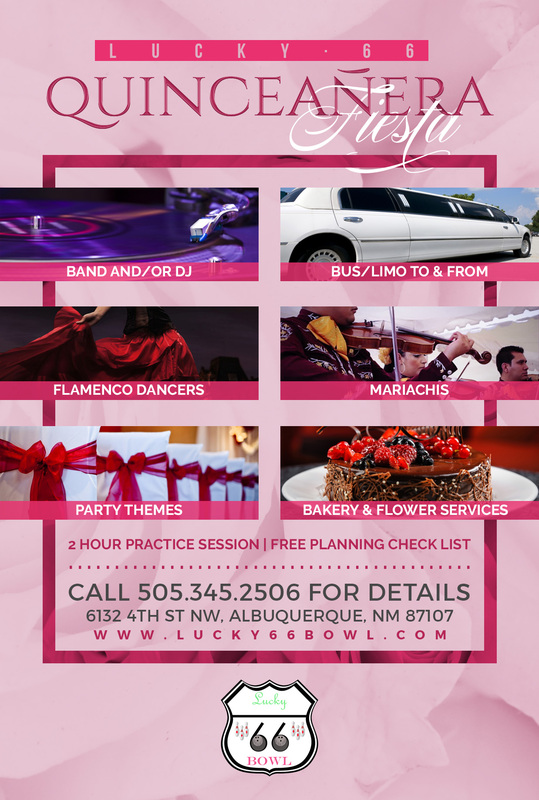 Looking for a stellar event venue in Albuquerque for your daughter’s Quinceañera or a birthday party for a friend or family member? You’re in luck. Lucky66 Bowl offers The Party Room and The Banquet Room to comfortably accommodate your celebration. With sizes ranging from 1,000 to 3,000 sq. ft and occupancy ranging from 50 to 175 people, you’re sure to find a great location for your upcoming Quinceañera or birthday party. We also offer additional hosting services like bar staff, limousines, decoration service, food services, Flamenco dancers, Mariachis, and more to make your treasured event the best night that it can possibly be. Whether or not you’re bowling at our bowling alley, you’re sure to have a blast partying at our Banquet Room or Party Room. Fill out the form below today! Please note: A member of our team will contact you after the form below is submitted. *For the safety of our customers no outside food is allowed in the banquet hall, though we can work with the caterer of your choice. All caterers must be licensed, insured, and bonded.